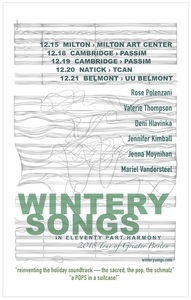 Wintery friends - tonight at Club Passim is SOLD OUT! As was last night! Woohoo. Natick show tomorrow night is close to selling out. So you're best option might be the UU Church in Belmont FRI 12/21 if you'd like to see a show. Thank you so much to all of you who've come to the shows at the Milton Art Center and Club Passim. Big fun for us. And we're so excited to play some new material (today my favorite is our version of the 12th century Lo, How a Rose sidled up to Queen with Rose's Arcade Fire a close second - and there are more...) as well as our stalwarts. Whoa whoa whoa. Is there such a thing as a December stalwart? Sounds vaguely unpleasant. Like a mandatory slog through slush without boots. How about Winter classics? Nope. Too classical. What we do is simply not that. Plus, we haven't been around long enough to have classics. That sounds vaguely pompous. Winter regulars? Well, if you can call 'regular' what changes we make to most of the music. Winter dependables? Makes me think of impending incontinance. Go Tos? NO, too corporate. YOU KNOW WHAT I MEAN THOUGH, RIGHT? Do send us word help if you are inspired. Hope to see you one of these next three nights.